A little snow today thank goodness it is not anything that is accumulating we need SPRING!!! I am working on some things but have not completed the projects yet so I thought that today I would post some of my older creations. I know some of you have seen these before but thought maybe some new people might like to see them. I do hope you enjoy them. Weather here is clear but still quite cold. Will this snow ever go away! 2. 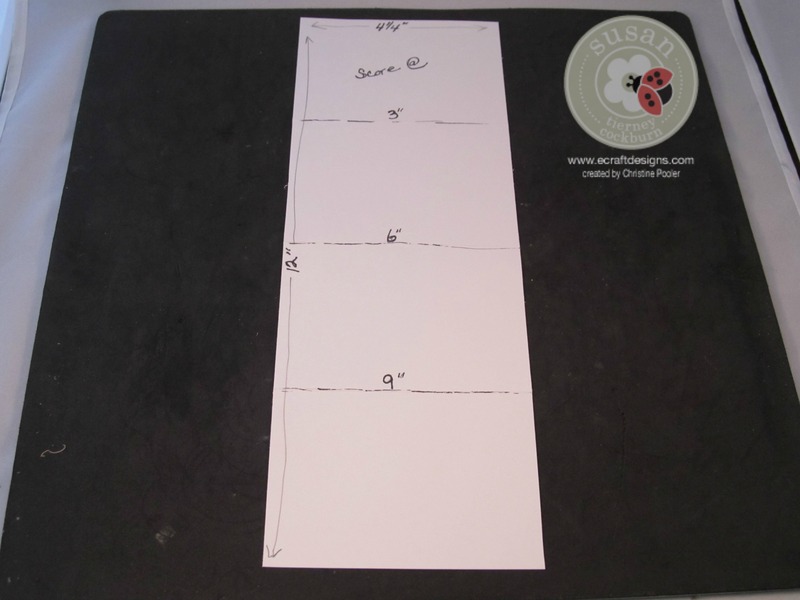 For the white center cut white cardstock 3-1/2″ square and emboss using the Tim Holtz brick embossing folder. Attach to center. 3. Cut and build your peony on center of card. 6. Place black ECD Peel Off Sticker “Thank You” on white oval and attach with pop dots or dimensional tape to the lower right corner. Hope this is inspiring and you will try your hand at this one! 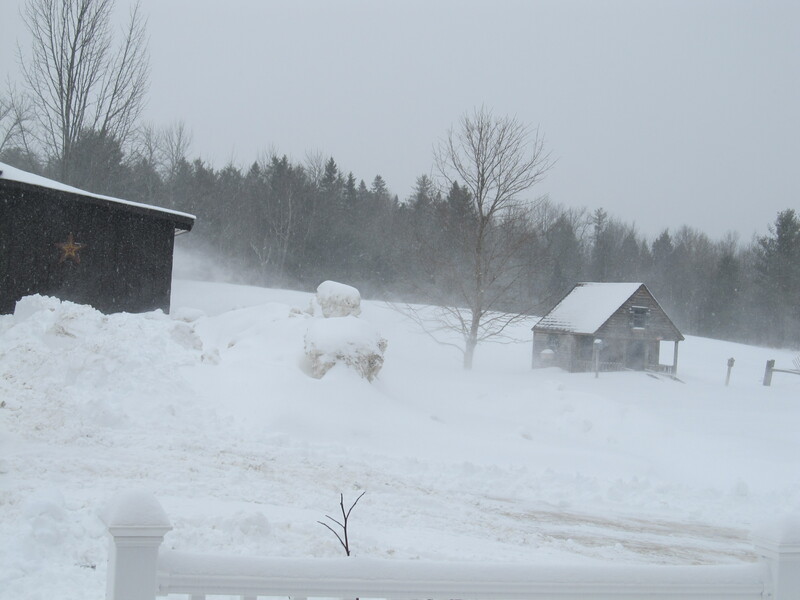 Today has been a very snowy day in Maine. This picture was taken about lunch time today and it is still snowing this evening. I do hope that we are pretty much done with this snow but on the other hand it was a good day to stay inside and create cards. I had some thank you cards and a birthday card to make so that has been my project today. I do need to make a few more thank you cards but that will be another day They are all the recessed window card tutorial for this card can be found here . 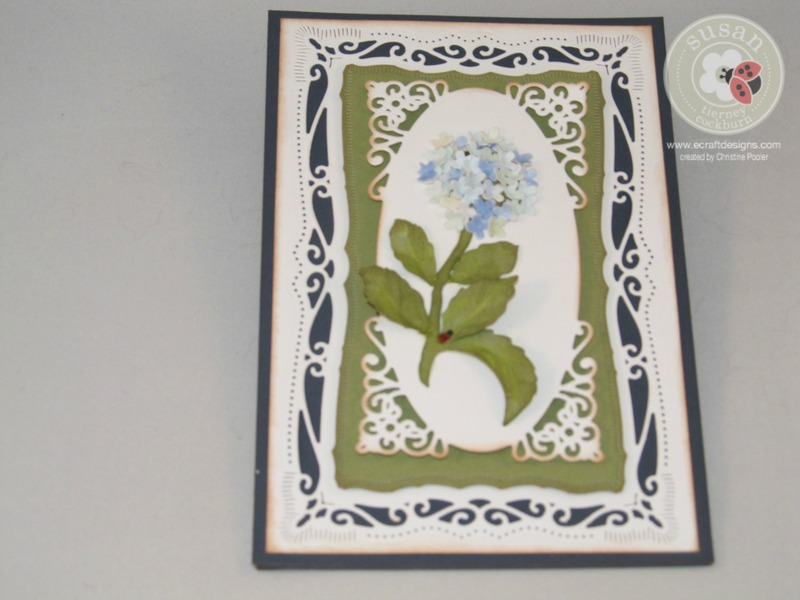 I seem to be hung up on these recessed window cards but they are fun to make and they look so different depending on the paper and embellishments. The papers I used were Graphic 45 French Country. 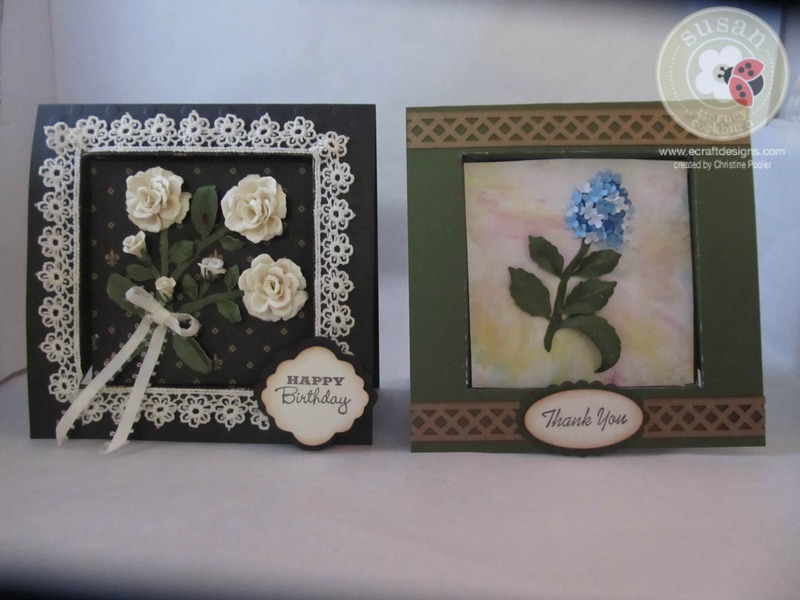 I used Susan’s Garden Notes dies Rose 2, Sunflower and Hydrangea. 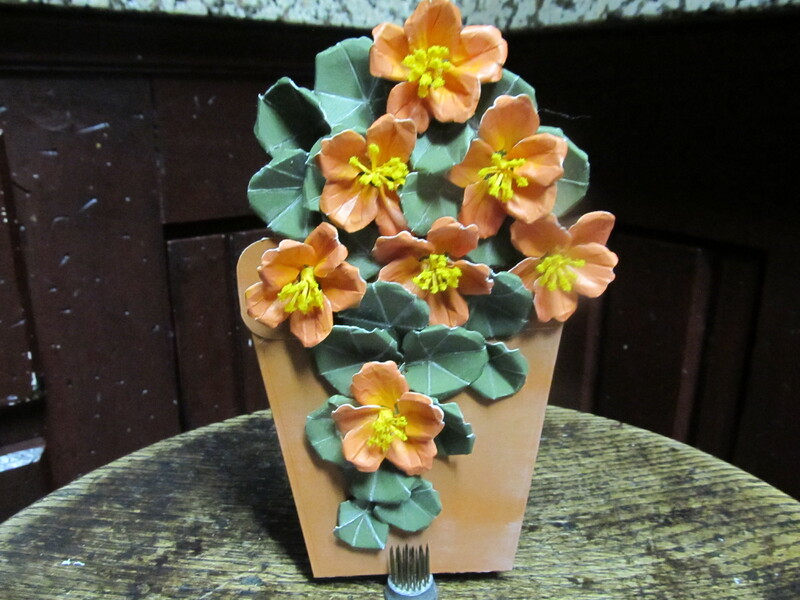 I just love making these flowers and Susan has great tutorial videos at Elizabeth Craft Design You Tube here . Please visit Elizabeth Craft Designs for All of Susan’s new dies plus all the other great dies and products they offer. From time to time I will be posting some of my older cards that I have made so please check back often. Thank you for visiting my blog. 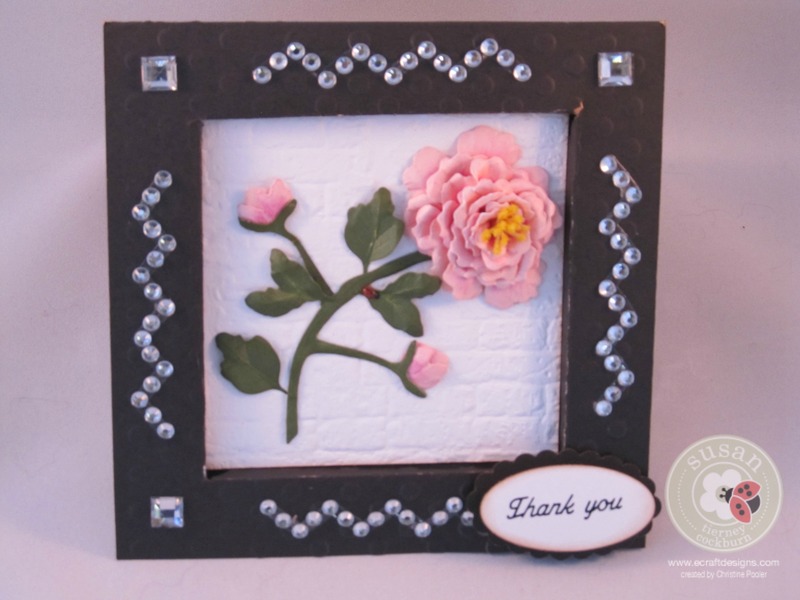 Today my post is a recessed window thank you card using Susan’s Garden Notes – Sunflower die ( I am loving all of Susan’s new dies they are awesome). Sunflowers are just such a happy flower that always brings a smile to my face. 1. 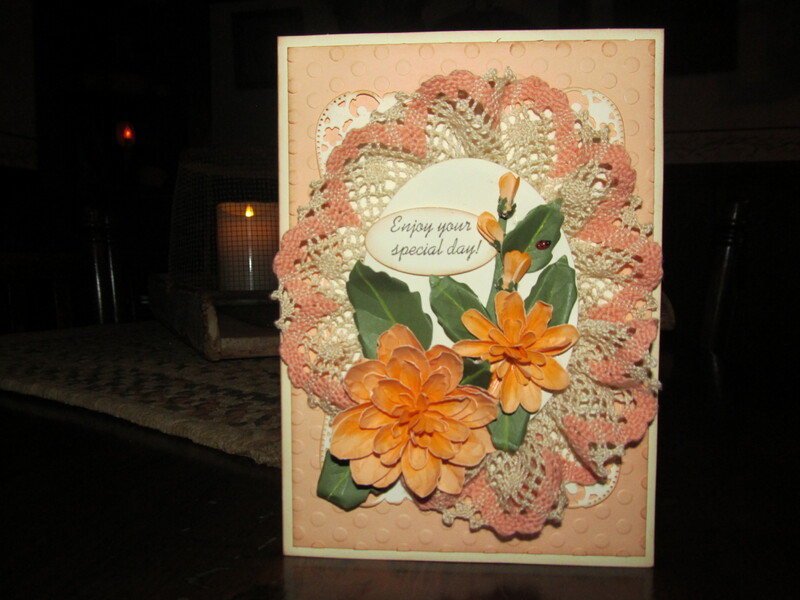 Finished card is 5-1/4 X 5-1/4. Once card is completed you can build your sunflower onto the card center. 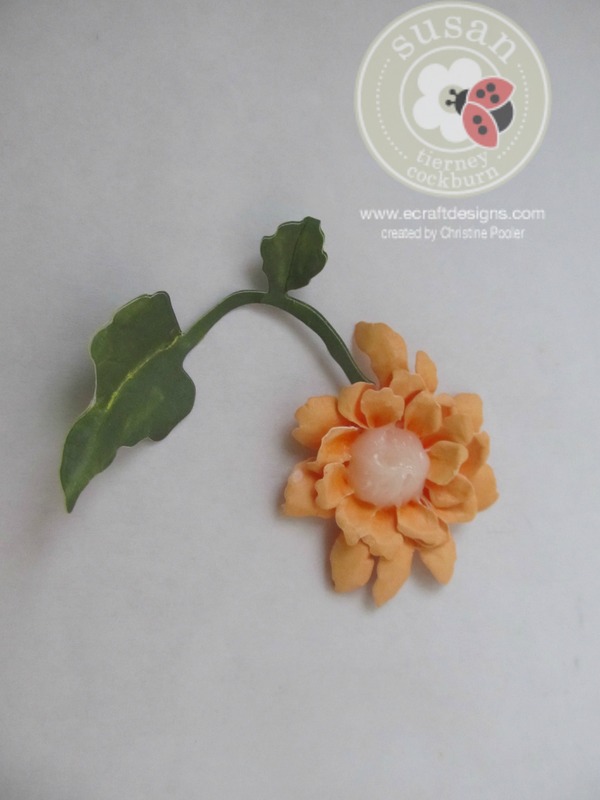 Susan has a great video for making the sunflower on the Elizabeth Craft Designs You Tube channel here . When I did the center of the sunflower I decided I would try a little something different making it a little more rounded. I did a couple rows of petals and then I added a small mound of Yes paste (it holds it’s shape) and then added the little seed pods. 4. Using 2 small ovals from Karen Burniston Accordion dies using the scallop die a black oval was cut and using the yellow cardstock a smaller oval was cut. 5. Starform text stickers (black) were used for the Thank You on the small oval. I have to say that I never really used stickers but these are so easy to use and look great. I added 3 small black crystals under the Thank You. 6. Attach ovals to the lower right corner of the frame using pop dots. 7. On the inside attach a square of coordinating paper over the back of the frame. 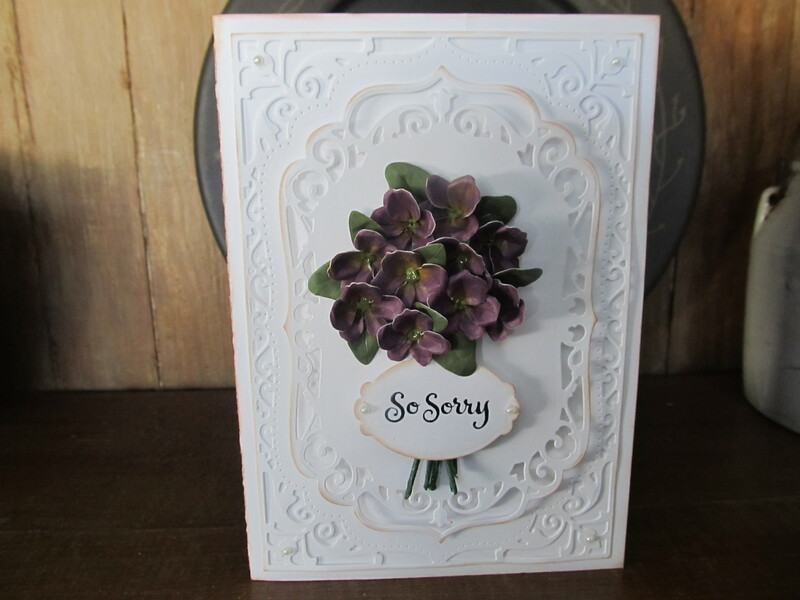 Take a pc of coordinating cardstock cut a little smaller than the inside of your card and attach so there will be a place for your sentiment or a note. A 3/4″ Sparkle Flourish was placed in the upper left corner and small black crystals were placed in the lower right corner. Hope you found this to be an inspiration to make this card. 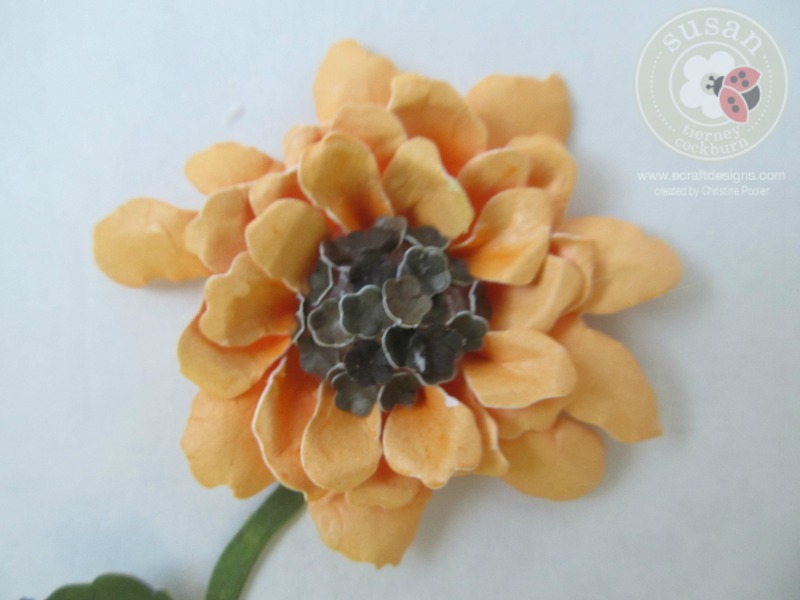 The flower can be changed out and of course different papers can change the look totally. Hope you go to Elizabeth Craft Designs to see all of Susan’s wonderful dies and all the other dies and supplies that they carry. 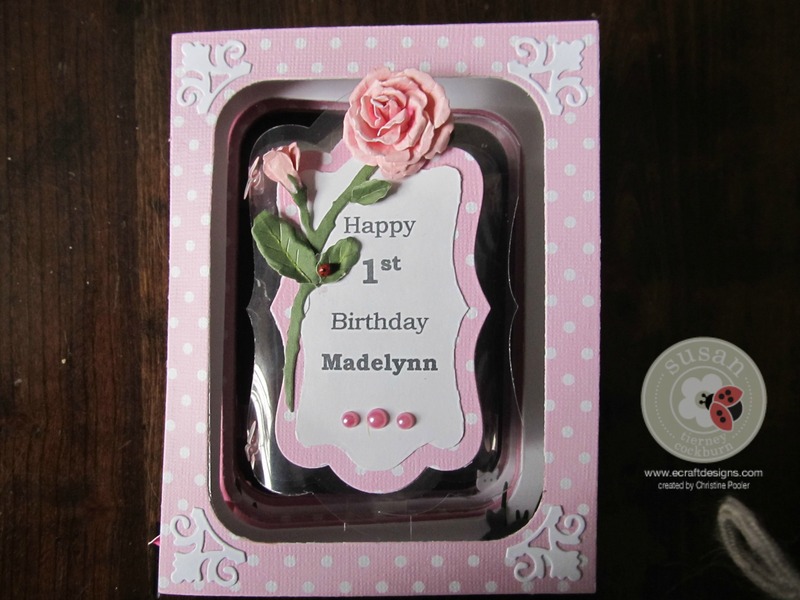 Today’s post is a mini album I made for my great great niece’s first birthday. For this album I used Karen Burniston’s Katie Label Accordion dies and Susan’s Garden Notes – Rose 2 die. I am just loving all of Susan’s new dies and stamps. It took a little time to do but was a lot of fun. 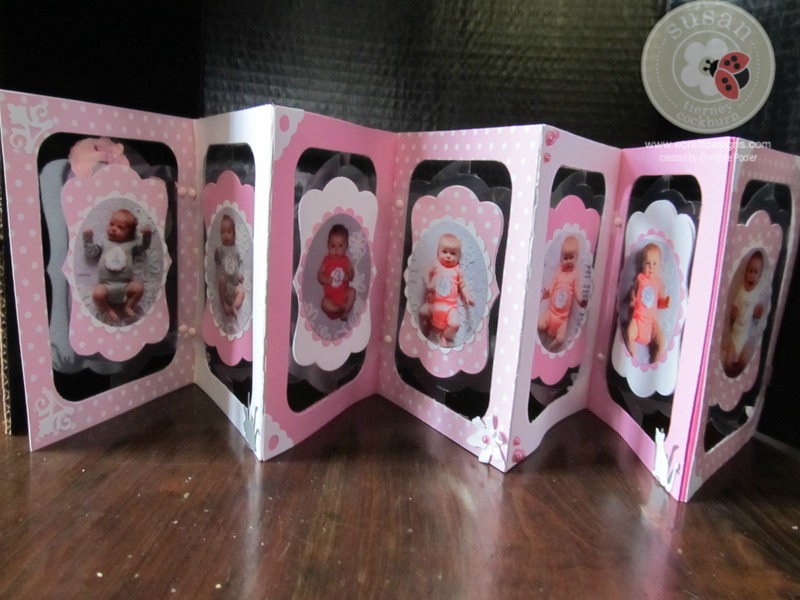 Karen Burniston has a great You Tube video here showing how to add clear pages to the Pop It Ups Accordion Album and is very easy to follow. Susan also has a great video for making the rose here . I actually made it with seven panels giving me a place for 12 pictures plus a front and back. 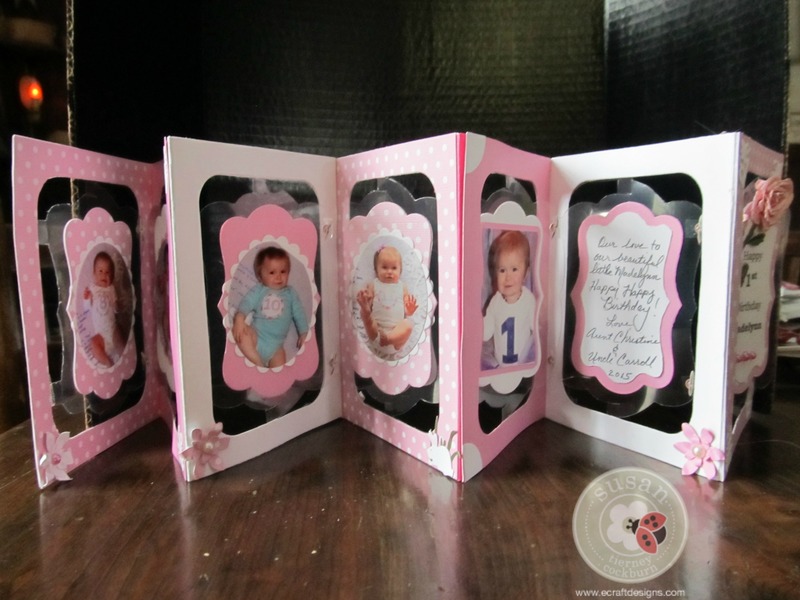 I used a pink double sided cardstock and a white cardstock which gave me a variety of color. The largest individual Katie Label die for a matt for the pictures along with the oval from the Oval Accordion Die. 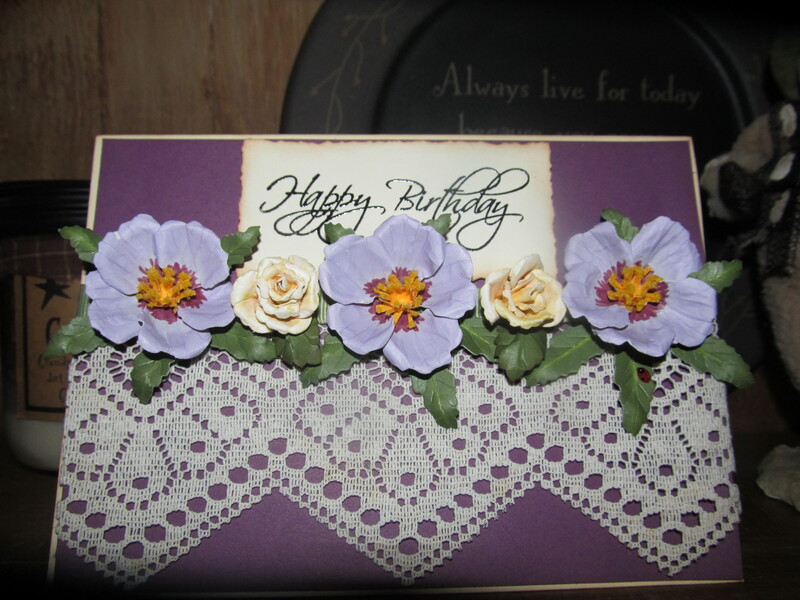 My embellishments were small flowers from my stash and various corners cut from Tags and More 1 and Tags and More 3. The front panel was printed on white cardstock and then cut with Katie label die and mounted it onto colored label. I do hope this inspires you to make some of these Accordion Albums. You can use as many pages or as few pages as you want for your project. They are a lot of fun to make. Hop on over to Elizabeth Craft Designs for your supplies. Thanks for stopping by today I do hope that this is an inspiration for you. please visit Elizabeth Craft Design and check out all their great products. Today I am doing my very first post on my new blog so please be patient with me. 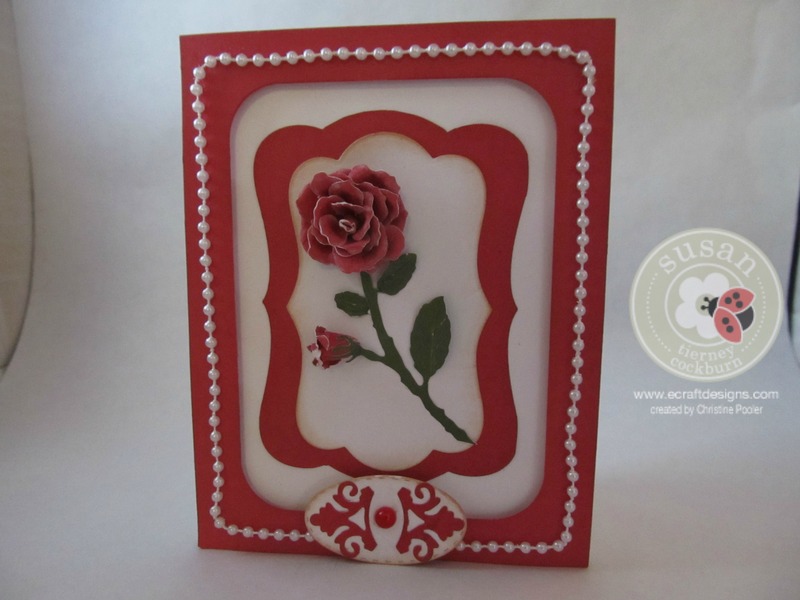 I have created a card using Susan Tierney Cockburn’s new Garden Notes – Rose 2 (998) die from Elizabeth Craft Designs and the Karen Burniston’s Katie Label Accordion (903) die also from Elizabeth Craft Designs I do hope you enjoy it. 1. 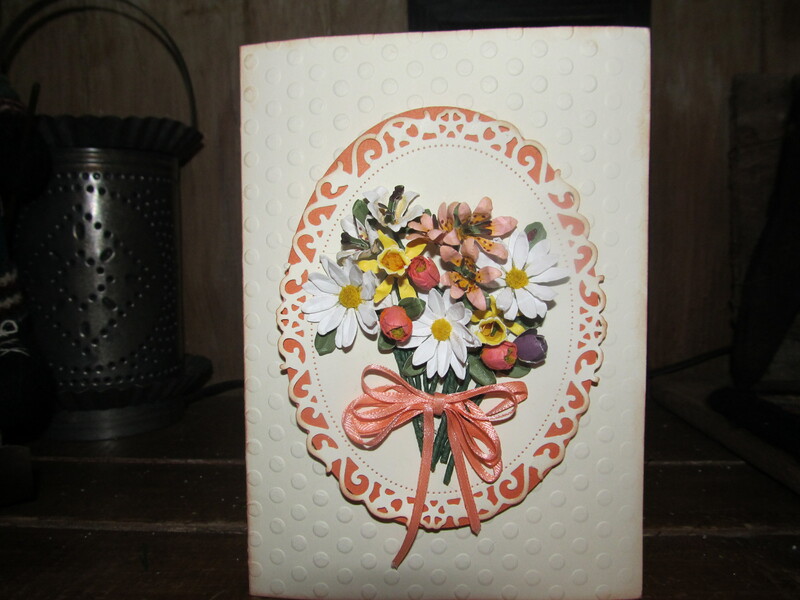 The card is a white A2 inked all edges with Vintage Photo Distress Ink. 2. 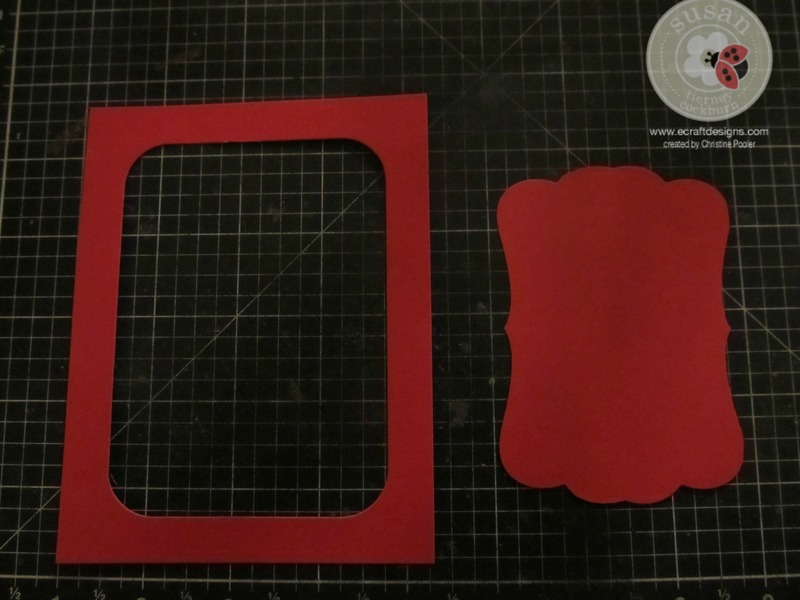 Using the main die from Katie Label Accordion die cut one from red cardstock and trim off all tabs leaving just the frame and ink edges. Taking the label that was cut from the frame trim off excess and ink edges.
. 3. Take the largest individual label die and cut from white cardstock and ink edges. 4. Attach the white label on top of the red label using ECD’s clear double sided adhesive then attach the labels to the front of the card using same adhesive. 6. 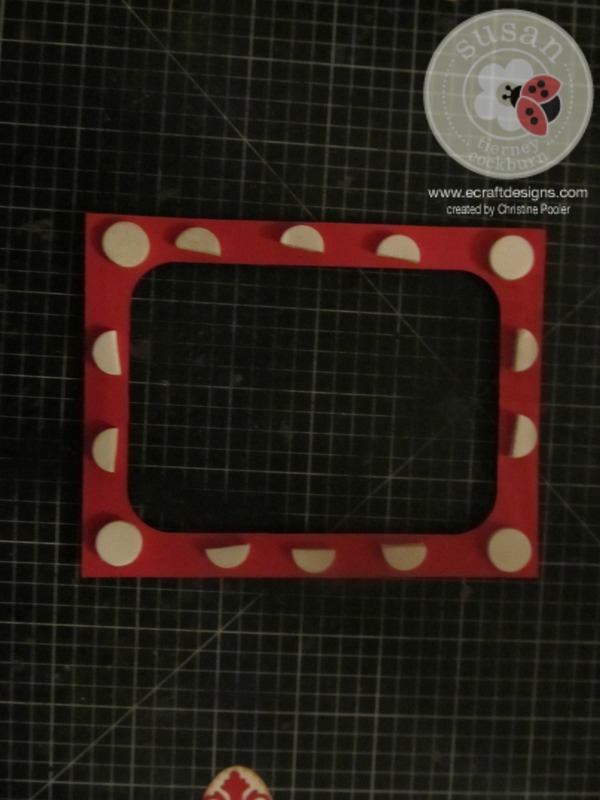 Add foam pop dots to the back of the frame. 7. 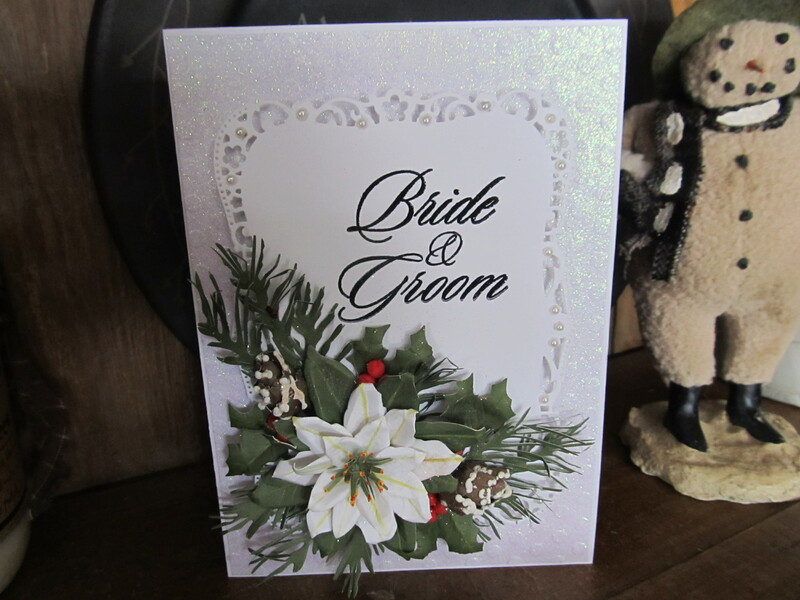 Add string of pearls to the front of the card using a clear quick dry glue. 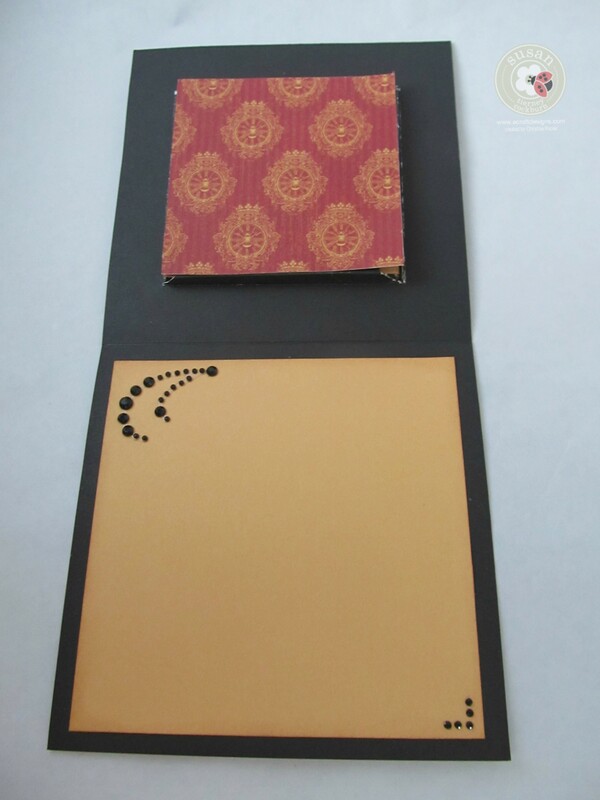 Attach frame to front of card. 8. Cut the small oval in white and ink edges. 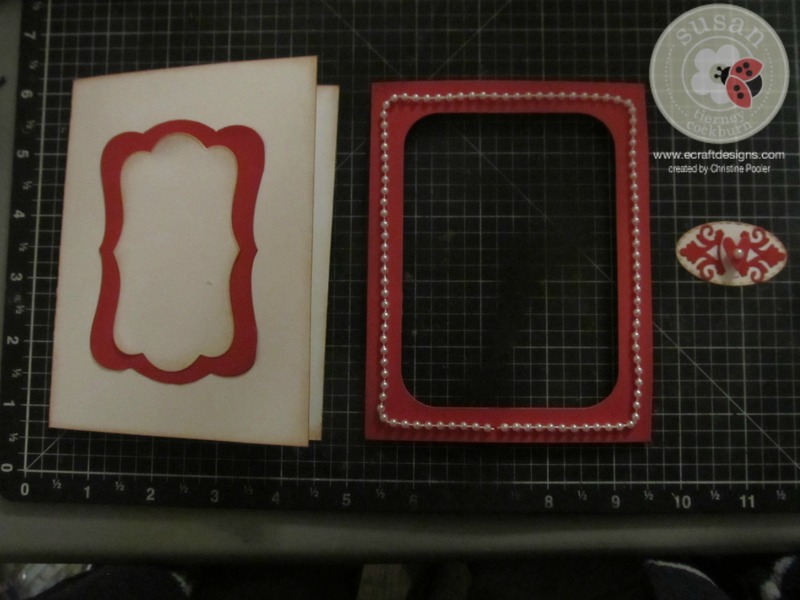 Cut the 2 small decorative pcs in red cardstock and attach to oval then attach oval to bottom of frame (this is where my string of pearls came together) using a clear glue. Add a red pearl to center. 9. For the inside of the card stamp your sentiment (Susan’s Cherish stamp used here) cut small heart in red and attach to lower right corner. Add pearl to center. I do hope this inspires you to try to make your own card using colors of your choice. 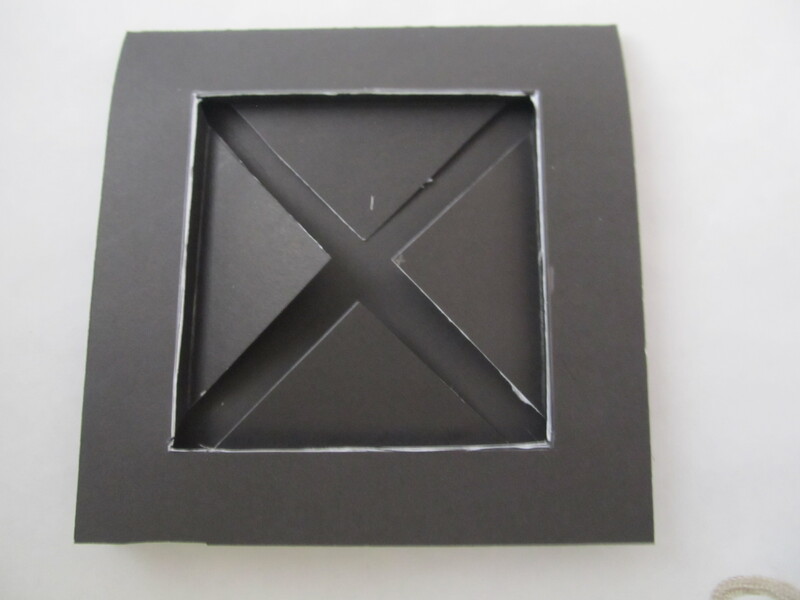 This is just another way to use the accordion dies with just a little adaption. Thanks for checking out my blog I do hope you will return often.